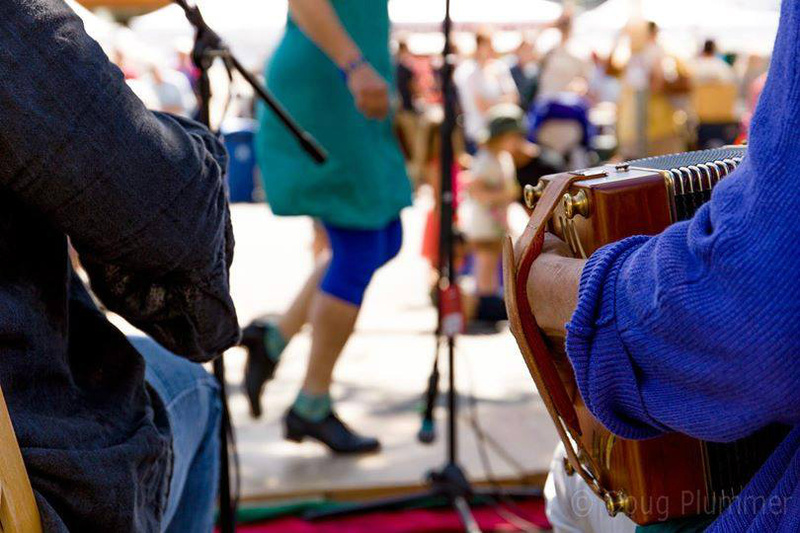 PODORYTHMIE is known for their high energy and good time performances of French Canadian music and dance. Fiddle, accordion, songs and lots of hard shoe step dancing interspersed with crankie (moving panorama) shows makes their performances unique. French fluency - Pascale Lelong was born and raised in France. 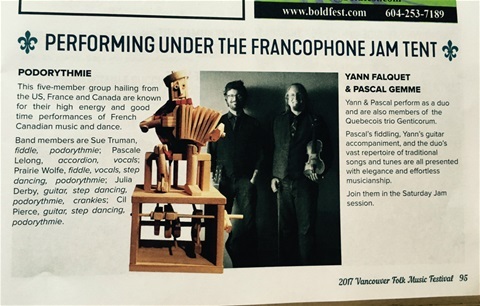 She sings songs from her childhood as well as songs from the Quebecois tradition. Performances can be narrated in French and/or English. Crankie Workshops have been a HUGE hit at festivals. 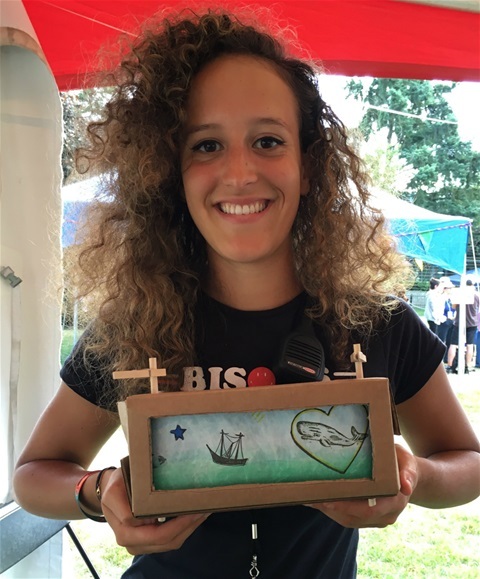 These workshops are for both adults and children, no art skills necessary! Led by Sue Truman, participants use a combination of rubber stamping and markers to create a landscape scene. Stamp sets include ships at sea; on the farm; in the woods; in the garden and many more. Crankies, also known as moving panoramas, were a popular folk art in the mid 19th Century with ties to France in the late 18th Century. Sue's website, The Crankie Factory, is the "go to" place to learn about the history of this forgotten art form and to see videos of crankies made by artists around the world. Sue has lectured and performed crankies in Europe, both US coasts and Canada. The step dance workshops are led by Cil Pierce who has over 30 years performance experience. She studied with Mary Janet MacDonald, John Pellerin and Harvey Beaton from Cape Breton and Benoit Bourque and Pierre Chartrand from Quebec. Both Sue and Cil danced with Sandy Silva (of La Bottine Souriante) in the 80s before she moved to Quebec! These are just a few of the spoons and limberjacks we have in our collection. 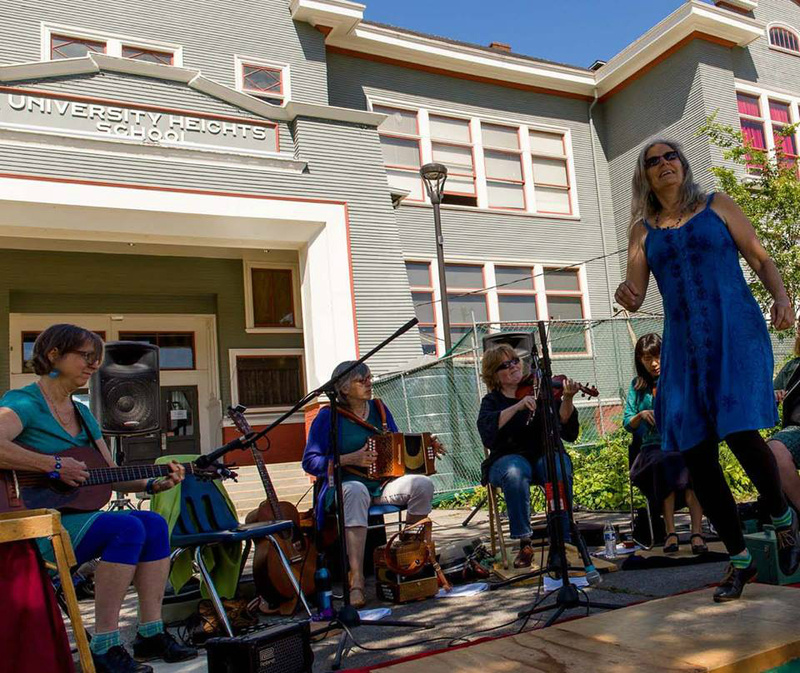 Rhythm workshops Learn how to accompany reel/gigue and 6/8/jig rhythms using podorythmie (foot tapping in your chair) spoons and limberjacks. 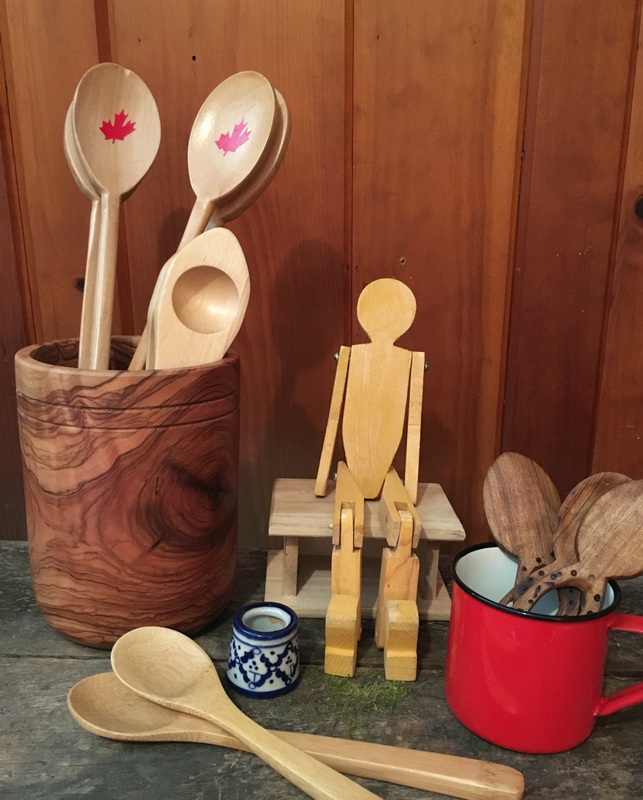 We have a large collection of wooden spoons: small, medium and large spoons to fit all hands. Or, try out one of our limberjacks. Children and adults can join in. Relax and enjoy playing along with the tunes! 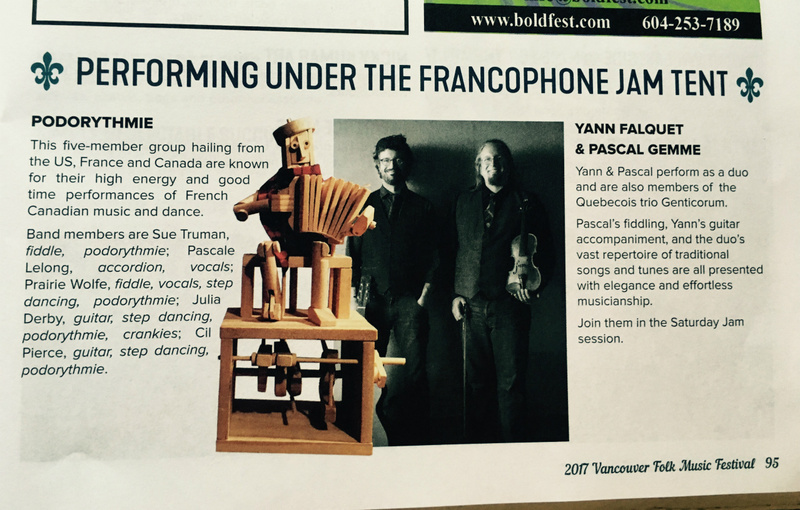 Between Prairie and Sue on fiddles and Pascale on accordion, they cover a large swath of tunes across French Canada. Adding step dancing to the session breathes energy into the tunes. Songs are welcome! Don't play? No problem! Join in with wooden spoons and limberjacks. You are welcome to try them out! Time to party! 2011 - Sue on guitar and Pascale on vocals, singing a song from her childhood in France.